Hi Everyone, it's Teresa here today wishing you all a very Happy Monday and I hope you all had a chance to check out our blog hop last week and the new challenge up for this month. We are starting to create for fall this month and it's my favorite time of year so I am really having fun with it!! 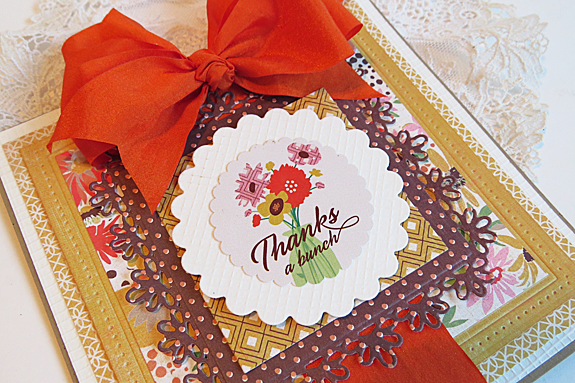 I so love cards with Big Ribbons on them and I know you can't mail them easy but they sure are pretty aren't they? I used a 6x6 paper pad from Basic Grey called Herbs and Honey. It had the perfect colors to go with my pretty ribbon that I got. I used a few of the layers of the Triple Floral Die set from Spellbinders to make the layers and then added a pretty sticker in the center to finish it off. Thanks for stopping over and hope you get inspired to make something fun! A lovely card! I wish I could find a good selection of ribbons in Canada. Exchange rates are a killer. I love your work.